Here is the first prototype of my three-wheel robot. At downstairs, there are Arduino Duemilanoa + Adafruits motorshield and all batteries. Upper part accommodates Arduino Mega+Xbee + MP3 trigger + speakers. This beauty is going inside a textile covered ball. After that he is ready to perfom to the audience. 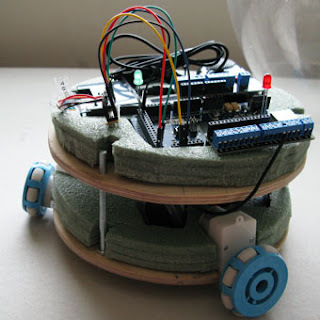 Instruction how I made this robot and also the framework of the arduino software is published in my homepages.